I first started to throw side arm when I very young because I imitated my brother Mike, who pitched in the MLB with the Diamondbacks and Indians. As I got older I just always pitched from two arm slots, one being a 3/4 arm slot and the other being a true side arm. In college is primarily played SS until my junior season where I served as Duke University's SS and closer. I was fortunate enough to be drafted by the Phillies as a pitcher that same year. 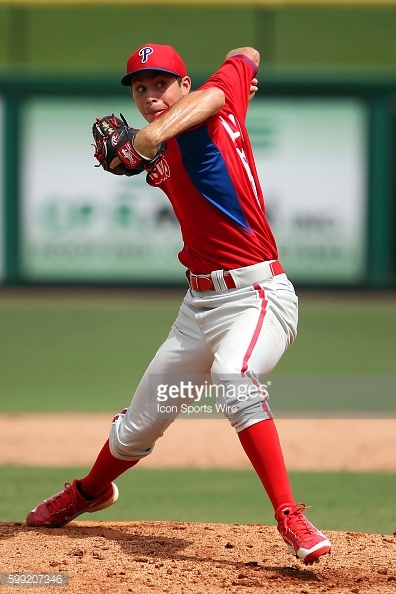 In the Phillies organization I only threw from that 3/4 arm slot for my first two professional seasons. In my third professional season I threw from both arm slots again. I was released by the Phillies this year but was incredibly lucky to be given another chance by the Miami Marlins organization and that's where I am currently pitching from both arm slots. This is where I feel I am at my best. I think it is incredibly advantageous that I am able to throw from my side arm angle because it is a unique look that hitters are not accustomed to hitting against. Throwing from two different arm angles allows me to manipulate the movement of the ball to disrupt the hitters timing. Having also hit in college I think it is fair to say that nobody is excited to hit against a sidearm pitcher. Being able to throw from a lower angle has always been a strength of mine as a pitcher. If my command was not there on a particular day throwing from my 3/4 angle I always could throw sidearm and battle from that angle and vice versa. I feel that my sidearm pitches are a real weapon especially against righties. I love that at this point in my career that I am able to throw from both arm angles. It is a common thought in baseball that throwing sidearm is a last resort to save someone's career when that isn't the case. Sidearm is just another effective way to disrupt hitters timing and produce outs. No batter is excited to go up to the plate and hit against a sidearm pitcher and that is an advantage for all sidearmers. Two words of advice that I always received throwing sidearm is to be as directional towards home plate as possible. It is important for me to keep my lower body's momentum going towards home plate otherwise I lose balls arm side. The other piece of advice is to not baby the pitch. Let the pitch go with authority and conviction and let the movement take care of the rest. By letting up on the pitch you are reducing the spin on the ball therefore reducing the movement of the pitch. Throw that ball with intent to break the hitters bat every single pitch. From sidearm I throw a two seam fastball and a slider. My fastball from sidearm will be from 87-92. My slider usually ranges from 74-80 depending on how I grip the ball. From 3/4 I throw a fastball, change up, and a slurve. My fastball from the 3/4 is between 92-95, change up is 79-83, and slurve is 77-81. I primarily throw sidearm to righties. I like to pitch as much as I can to the inner third of the plate to open up the outer third for later I the count. I am most effective when I am able to keep the ball down in that inner third of the plate and produce early weak contact on the ground. To lefties I will usually raise my arm slot so I can use my change up more effectively against them. Just like all pitching coaches preach, as long as I get ahead of the batters I will have success so I can throw all my pitches to disrupt timing. My favorite part of throwing sidearm and from 3/4 is that it makes me unique. There are not many pitchers that throw from two different arm slots in professional baseball.